- It is never revealed what became of the Borg infant. When asked in 2000, Brannon Braga stated the infant had been returned to its people off-screen. "The baby was returned to its people, which you did not see depicted in an episode. We considered showing it on-screen, but decided it would be best to focus on the remaining Borg kids. They have given us some great story material so far." - This episode marks the first appearances of Icheb, Mezoti, Azan, and Rebi on the series. - The Borg on the cube demand the USS Voyager's navigational deflector to reestablish communication with other Borg in the region. This is an allusion to Star Trek: First Contact, where the Borg tried to construct an interplexing beacon on the navigational deflector of the USS Enterprise-E to contact the 21st century Borg in the Delta Quadrant. - Mezoti's dress in the last scene is a reuse of Isabella's from TNG: "Imaginary Friend". - At the end of the series [SPOILER], Icheb is the only Voyager inhabitant native to the Delta Quadrant who remains with the ship when it returns to the Alpha Quadrant. All others (Neelix, Kes, Azan, Rebi, and Mezoti) either returned to their own people, or a neighboring species. "We will return your crew members in exchange for specific technology." "Talk about unusual behavior. The Borg negotiating?" "Not today and not by you." "They're not exactly drones. Mature Borg are predictable. They'll ignore you or assimilate you, but these juveniles, they're unstable." "They are contemptuous of authority, convinced that they are superior. Typical adolescent behavior for any species." But ignoring Villain Decay and whatever the official TV Trope name is for "Cute Kids for Ratings," I can't muster much enthusiasm for the episode on its own merits either. Sometimes I feel like, whenever we see the Borg cube interior sets, the show kind of shuts its brain off. I'm also admittedly a little bitter that they stole the excellent opening gimmick from TNG: "The Mind's Eye". Still, the producers are pretty consistent in trying to wring some body horror out of the Borg, and here, the Borg infant kind of worked on that level (though the puppet maybe could've been more realistic). And I suppose I'd concede that, if the goal was to continue to feed story hooks to Seven, Icheb et al. aren't a bad way to go; there's at least the potential for some fresh character development later. I will also say this: on rewatch, the performances of Icheb actor Manu Intiraymi (whose name, based on his MA page, I'm guessing is due to hippie parents) visibly improve from season six to season seven. * Missed Opportunities to Acquire Borg Transwarp Technology and Get to Earth: At least two now, with at least one more to come. Particle of the Week: The unnamed pathogen. Pointless STO Comparison of the Week: Lots of stuff going on here, but the standout is probably the feedback pulse, which became the go-to tanking move for ages in Star Trek Online. (I feel like that's been done before, but can't be bothered to go look.) Also, reclaimed Borg drones are available from a couple of different sources, including the cash shop for a Seven of Nine knockoff, and a mission achievement for a male drone with exoskeleton intact. * Maximum Possible Photon Torpedoes: -8. Presumably, shuttle torpedoes and full-sized ship torpedoes are not cross-compatible, so the three fired by the Delta Flyer wouldn't count even if I were still being very persnickety. * Crew: 141, with the first gains since Naomi Wildman. Missed Opportunities to Acquire Borg Transwarp Technology and Get to Earth: At least two now, with at least one more to come. Right? Why wouldn't they loot the ship? Also: why wouldn't the Borg go scrap it to prevent such a scenario? In the old days, Borg drones were meticulous about destroying fallen dudes to keep their tech out of lesser hands, and that was a good policy. * The baby is creepy. * The plot is okay. I don't really have any qualms about the basic sequence of events. In particular, Mezoti confronting Harry with the playing cards is pretty effective. Also, the Lord of the Flies leader kid is believable enough, (although I was disappointed by his Disney death). Anyway, apart from their appalling failure to loot the ship, and the Borg's failure to keep it from being looted, the story works as a self-contained incident. * From an arc standpoint, this puts more focus on Seven. I like Seven, but I'm really feeling the loss of plots centering on... well, anybody else. Like, I miss seeing B'Ellana doing anything interesting and whatnot. This marks the show being about her even more than before, and that's kind of a downer even though the kids themselves don't bother me so much. Anyway, I gotta run, but I'll be back when I have a little more time. Ugh. That was infuriating. It's RIGHT THERE. We've already seen a raid on a Borg ship happen in Dark Frontier. We know that Borg transwarp coils can help the ship get home faster. Not even mentioned. Borg cubes are a treasure trove of other tech, too. Shield generators? EPS conduits? Power relays? Voyager uses Borg technology in their power regulation systems. The Astrometrics Lab was designed with Borg-enhanced sensors. I'm pretty sure the Delta flyer includes Borg tech enhancements, too. They should be stripping that ship to its framework for parts. This is a huge, huge plot hole. Big enough to drive a cube through. 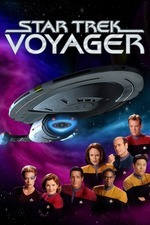 Depending on how we look at it, Voyager can be divided into two different shows, two ways. Seasons 1 through 4 are the Jeri Taylor years. Seasons 5-7 are the Brannon Braga years. Seasons 1 through 3 are the Kes years. Seasons 4-7 are the Seven of Nine years. Season 4 is the bridge season. The actors and writers seemed to hit their stride with some of the best episodes of the series: Living Witness, Year of Hell, Message in a Bottle, Scorpion, etc. Everything fell into place. But things began to go downhill from season 5 forward. So now we're in season 6, and that's when Robert Beltran became much more publicly vocal about his dissatisfaction with the show and its writing and the shift in focus away from some of its core characters, like Chakotay, B'Ellana, Kim, Neelix, etc. Beltran has repeatedly said that his "blunt honesty" did not create dissension or hard feelings on the set, but at one point he had complained that there was nothing to for him to do and Kate Mulgrew was asked about that in an interview. She replied that it was a "lazy actor's response." After the show ended, Beltran would go on to speak in interviews about how the Doctor and Seven were harder to create dramatic tension around, because the writers had made them somewhat omniscient. Since the sense that the crew or ship were in realistic jeopardy was rarely shown, he felt that episodes which showed the ship in battles or the crew at risk were toothless. It was a valid complaint. Some later scifi shows have given their audiences the impression that anyone in the cast can die or be permanently injured. It adds both to their realism and ups the dramatic tension. But speaking to Mulgrew's pushback, the constant Seven episodes were also a sign of a lazy writer's room. It's easier to create stories around a character is exploring their humanity, but who simultaneously has the knowledge and power to solve most plot devices. It's boring to see the same story formula pop up several times in a show. I wish they hadn't gone to that well so frequently. I tend to agree with the two main criticisms that have emerged, that of not looting the cube and of the show falling into the trap of making Seven-centered episodes that could have easily featured another character, although I don't think that that necessarily applies here--it makes more sense for this episode to feature her. (For that matter, Harry got some good bits on the side, and the shot where he's infected with Borg nanoprobes is pretty gruesome.) It's that, say, "Tsunkatse" could have featured another character, in particular Chakotay or B'Elanna, even though it worked fine as a Seven episode; Chakotay is a boxer and we've seen B'Elanna hold her own in hand-to-hand combat. I tend more toward "lazy writer's room" rather than "lazy actor's response." Also, the lack of interest in looting the cube is odd, especially given their focus on that in "Dark Frontier." I think that an easy solution to that, plus the inexplicable lack of interest on the Collective's part in retrieving or destroying the cube, would have been to have the Collective issue a command to the cube to self-destruct, and have the last act be the proverbial race against time to avoid that, with First insisting that they either had to convince the Collective to abort it or go down with the ship. Nevertheless, I still think that it was a good enough episode. The basic premise makes sense--that the mysterious pathogen (which will be not-so-mysterious in a few episodes) would have skipped over the kids in their maturation chambers, and that the Collective wouldn't have wanted to retrieve tech that may have some trace of this pathogen left in it. We saw Borg maturation chambers all the way back in TNG's "Q Who", complete with a lil' baby all Borged out, and the kids will stick around for a few more episodes, providing some rare continuity. It would have been nice if some other crew members had gotten to foster-parent the kids, and may have even led to some discussion among the crew members as to whether they should start on the next generation themselves, although you could argue that that kind of happens without the discussion anyway. Harry planting the cards as breadcrumbs was a nice touch, ditto for Mezoti discovering them, and it was cute that Seven said "sweet dreams" as the kids went to "sleep". I don't think it's laziness in the writer's room. I think it's that Seven was a shiny new character to play with, and she was kind of the Spock (the alien-ish observer learning about humanity) that these shows thrive on. She was also gorgeous and a fan fave, people were putting her on magazine covers, and I expect UPN was leaning on the show's creators to feature her as much as possible. She was the breakout character, in short. I do wish stories had been parceled out to other characters more, but this is another instance where I feel like fans tend to assume the worst of a show's creators. I think Seven was a great character and the writers saw a lot of potential in her, so maybe they erred on the side of making this the Seven of Nine show. But I don't think the show was going downhill at this point, it was just evolving. I remember Beltran airing a LOT of dirty laundry back then, and while I can enjoy gossip as much as anybody I didn't care for his public crabbing. It was only going to make a tense set even worse, and I got the feeling he was really accentuating whatever negativity was going on. He was obviously bitter about the reduction of his own role, and he seems like kind of a scrappy guy at the best of times, so he pitched a lot of fits. There's being outspoken and then there's just being a baby. I like Chakotay too, but given the choice between writing a story about Seven or Chakotay, I don't think it's so surprising they tended to opt for Seven. this is another instance where I feel like fans tend to assume the worst of a show's creators. I think Seven was a great character and the writers saw a lot of potential in her, so maybe they erred on the side of making this the Seven of Nine show. But I don't think the show was going downhill at this point, it was just evolving. It may well not have been LAZiness exactly, but Braga is showrunner through the end of season 6, and as he and Jeri Ryan were dating, I think it's safe to suspect that the Seven-heavy focus could be at least partially attributable to that. Season 7 appears to be more balanced (e.g. Torres gets noticeably more good episodes), and for that season, Braga left to start work on ENT; Ken Biller took over showrunner duties. Still, better that the show be Seven-heavy than, say, Neelix or Naomi or even Harry-heavy. Is there any way to get a quick episode summary above the cut, even just a sentence? Without one I'm not sure what episode we're looking at, so I end up piecing it together from the comments and usually having to click over to MA just to confirm. i'm kind of on Beltran's side in this. He could have just shown up, said "Yes Captain" and "Right away, Captain" and collected his paycheck. But I think that he had larger ambitions than just having a steady gig for seven years and residuals for as long as Voyager was rerun. And it's not like Jonathan Frakes and Nana Visitor didn't get to do plenty with their characters. I mean, I like Seven a lot, too, but the previous series were pretty good about spreading it around to the rest of the ensemble. And, if a particular character is underdeveloped, that's a reason to give them more screen time, not less. Not that I necessarily blame the showrunners. I think that it's pretty obvious that UPN was still on their case about the ratings, and this may have been their gambit at trying to do something about that. Although that's a good point about S7 and Ken Biller taking over as showrunner. But I think that he had larger ambitions than just having a steady gig for seven years and residuals for as long as Voyager was rerun. Braga and Ryan's relationship does make an appraisal of this season more complicated, but I strongly suspect that even without the nepotism Seven would have still been given most of the attention. As I said above, she was the breakout star of the show. She was Voyager's Fonzie! Once you've got a situation like that, the best the original cast can hope for is that they don't get Chuck Cunningham'ed. If Ryan is indeed referring to Mulgrew here, then it would appear they were actually feuding, which would have been an impossible situation for the writers.